When I first started sketching in the fall of 2011, I committed to trying to sketch every day, but I also told myself that if I sometimes fell behind or just got so busy that I couldn’t manage a sketch one day, I wouldn’t beat myself up over it. As a result, I’d sketched almost every day, but occasionally when the weather was bad, and I didn’t feel like going out, I didn’t do one. Or if I’d had a really hectic, busy day, and squeezing in a sketch just felt like too much “work,” I gave myself a break. That’s how it went the first couple of years. On Jan. 1, 2014, I tried something new. I again made a commitment, but this time I made it to draw every day for a year (“Draw or draw not – there is no try”). I didn’t want it to become a chore – another to-do item to check off – and I didn’t want it to become a mundane habit that I do because it’s good for me, like flossing or taking a calcium supplement. I decided to think of drawing as if it were yoga. (No, I’m afraid I don’t do yoga daily . . . I can commit to only one daily thing at a time!) I’ve been taking weekly yoga classes for more than four years. My instructor says yoga is both a practice and a discipline. We work regularly on poses to become stronger and more limber gradually – that’s the practice. The discipline is more about an internal focus. We sometimes have to work through movements or poses that are not easy or comfortable; we challenge ourselves and work from the inside outward. With drawing, the practice is the physical act of putting pen to paper every day and building skills gradually. For me, the practice part is pure pleasure – I love sketching, so doing it every day is fun and not hard work at all. But if sketching is also to be a discipline, it can be hard work. The discipline part would be to challenge myself and sometimes draw things that are difficult or uncomfortable, because that’s how I would grow. Initially I thought I would announce my daily drawing commitment here on my blog to “keep myself honest,” be accountable to my readers, etc. But the commitment I made was to myself, not my blog readers, so what would be the point? I decided not to announce it. I didn’t necessarily intend to post every sketch. 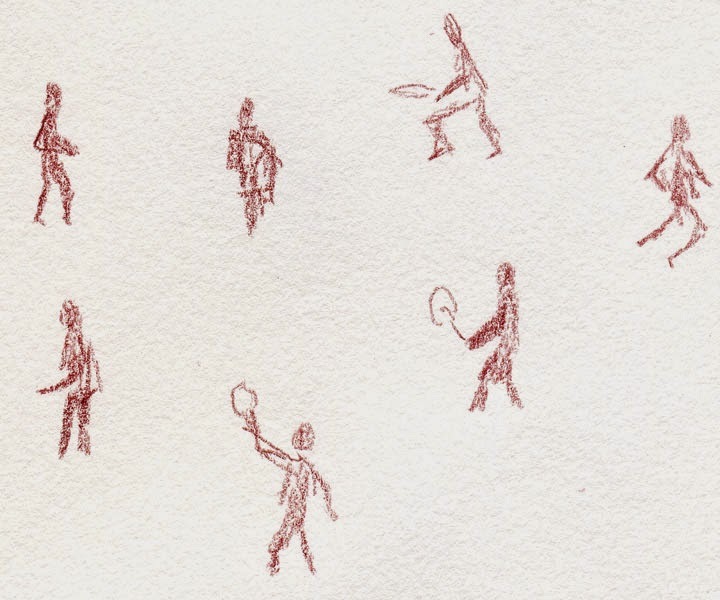 One criterion for my blog is that if a sketch has a “story,” then it’s worth blogging about. Let’s face it – some sketches were just so mundane or ordinary that I couldn’t drum up a story for them, so they stayed in my sketchbook without being posted (a few of those appear here today). On many days, I ended up making more than one sketch, usually when I went out with other sketchers and therefore spent a couple of hours in one location for that purpose. But on days that I made two or more sketches, I didn’t take the next day off. The objective wasn’t to make 365 sketches; my objective was to sketch every day. 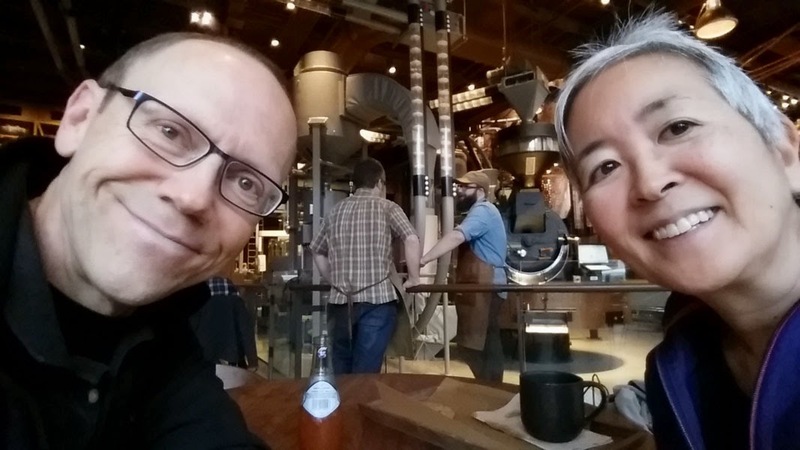 During the best of summer, I got out to sketch on location every day for many days in a row – an urban sketcher’s ideal! I can also recall a handful of days when my schedule was crammed and I really didn’t have time for a sketch – but somehow I managed to find 5 minutes to dash off a quick one before going to bed. Those tended to be sketches of writing instruments that happened to be on my desk or portraits from catalogs I grabbed out of the recycle bin (a couple of those appear here, too). Today is Dec. 31, and I am happy to say that I sketched every day during 2014. Most of those days felt effortless because the practice – the part that contains the pleasure and fun – took over. But I also remember some days that took quite a bit of effort because the subject matter or technique pushed me out of my comfort zone. For those, I had to exercise discipline – trying to push past my usual limits to grow and become a stronger, more limber sketcher. Whichever way I looked at it, as a practice or a discipline, the result is the same: Drawing every day is better than not drawing every day. 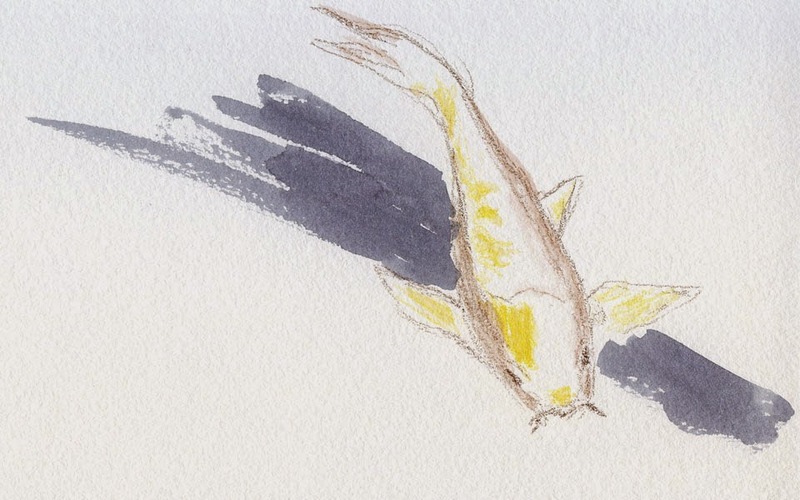 Tomorrow is Jan. 1 – day 1 of the next 365 days of sketching. Happy New Year and happy sketching to all of us! 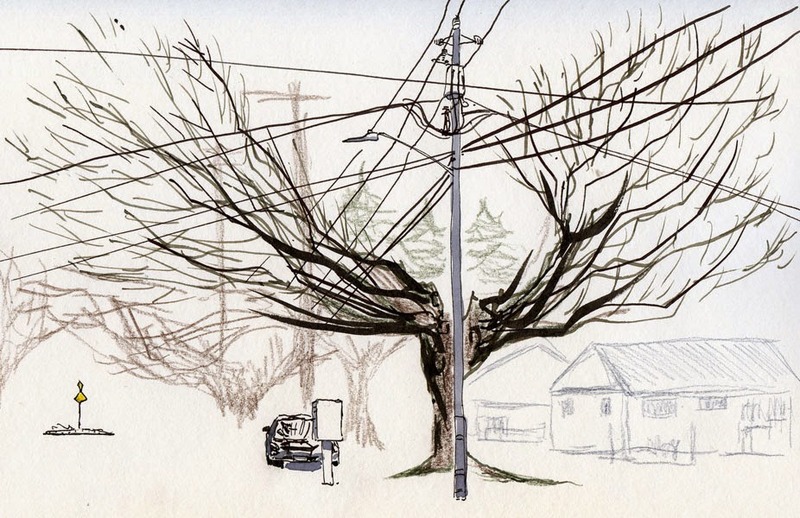 All year I’ve been sketching unfortunate trees that have been hacked, chopped and otherwise mutilated by city utilities to make way for power lines. 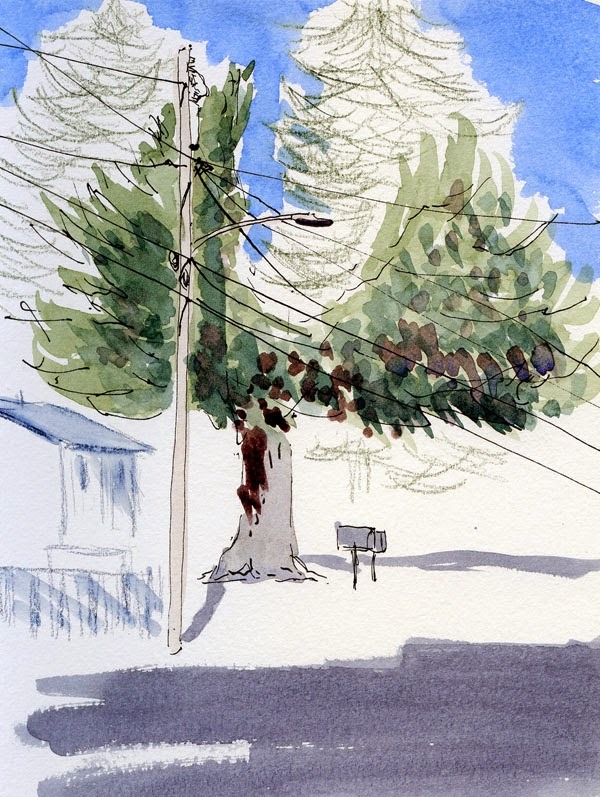 I have plenty more such trees to choose from, but this morning I thought I’d sketch one that has managed to remain unscathed: It stands on the safe side of this street in Shoreline, opposite the power lines. I’m open to risk and challenges when I know the outcome could be rewarding. But if I’m going to be in the same position for a while, I like to stand on the safe side of the street. Here’s to a great new year full of risk, challenges and knowing which side of the street to stand on! The daytime temperatures have been in the low 30s and even high 20s this week. That’s pretty cold anywhere, but it’s really dang cold for Seattle! I was just reading on Nina Johansson’s blog about how she sketches in sub-freezing temperatures by mixing vodka with water in her waterbrush to keep it from freezing. 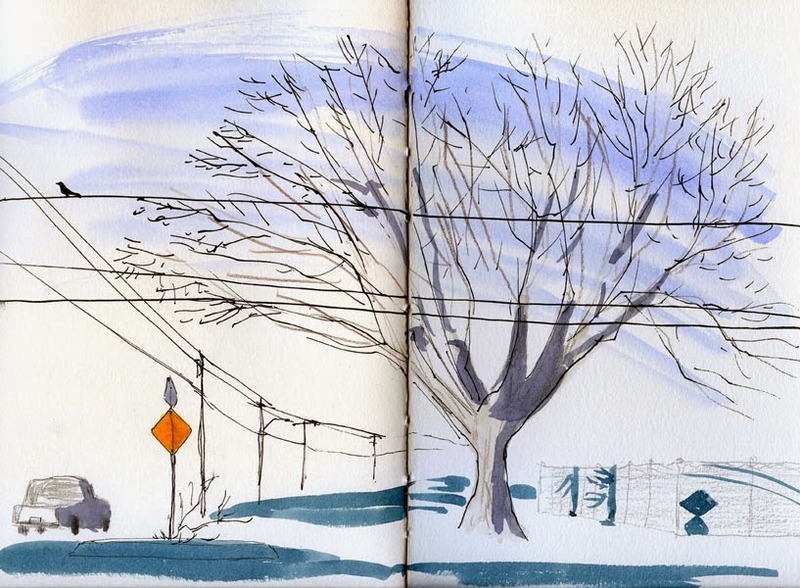 Mike Daikubara just posted a sketch he made in Vermont, where the temp was 19 degrees – without gloves! Guess what? 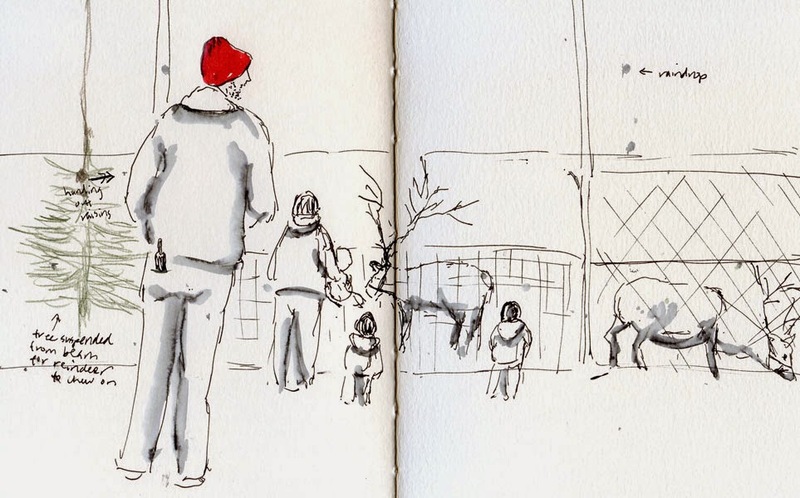 I don’t have any stories of cold-weather sketching heroics. (Heck, I wear a hoody in the house.) But if my car is fully heated when I turn the engine off, I can sit and sketch in it for about 20 to 30 minutes before it’s no longer comfortable – just enough time for each of these sketches. (I ♥ my mobile studio!) 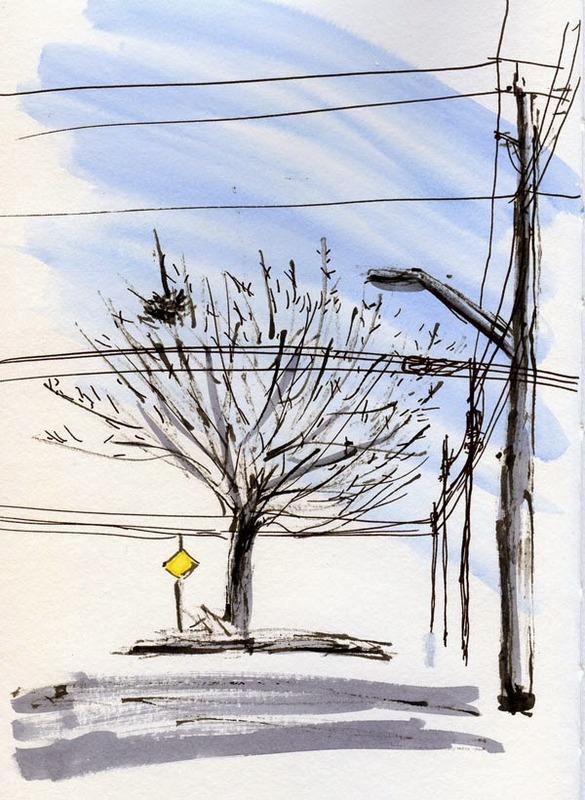 Yesterday’s empty-nest sketch was in my own Maple Leaf neighborhood. This morning’s tree with the big bite taken out of the middle was in Shoreline. I need to go crank up the thermostat another notch. Stay warm, everyone! I’d never heard of the Around the World Blog Hop before Joan Tavolott invited me to take part, but if it’s about art and blogs, I’m game! 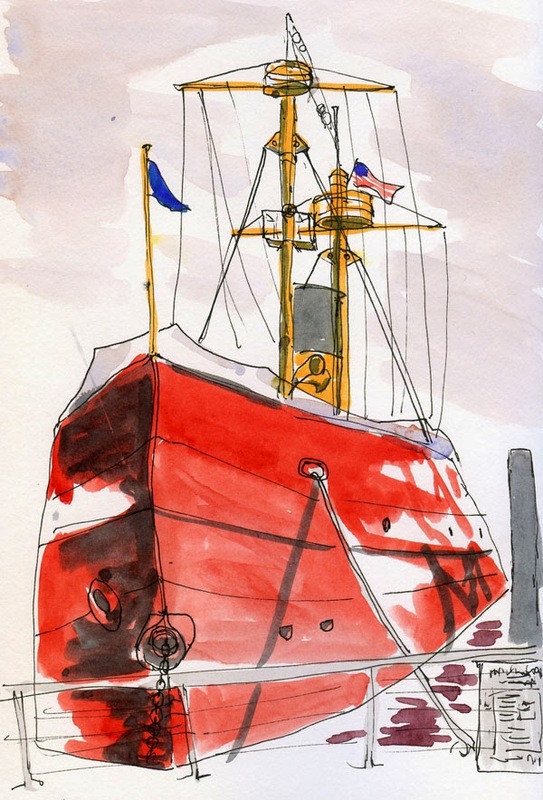 A plein air painter and urban sketcher in New York, Joan is one of the most prolific artists I know! Her daily blog is filled with beautiful watercolor landscapes, urban sketches, portraits and still lifes. Although I have never been to New York, I feel like I get to know a little more about Long Island every day through her delightful sketches and paintings. After you enjoy Joan’s work, hop over to the blog of Michele Cooper, whom I invited to participate on Jan. 5. A fabulous watercolor painter as well as a teacher for many years, Michele inspires me with her dazzling, light-filled paintings and whimsical journal pages. 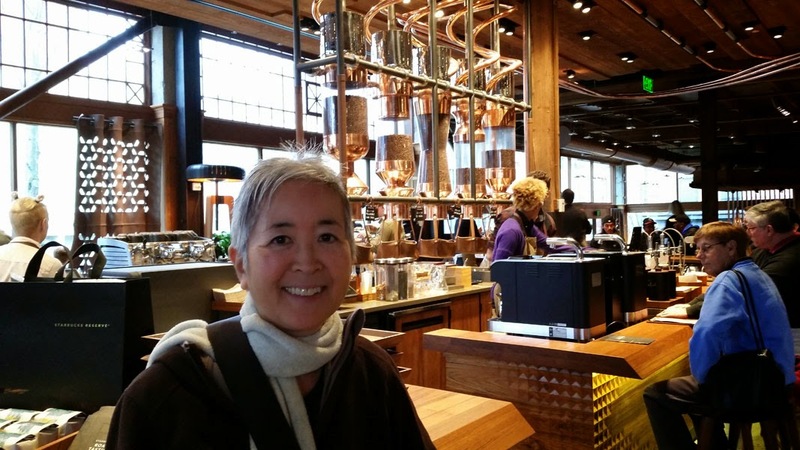 She’s also an avid urban sketcher with the Whidbey Island Sketchers, Anacortes Sketchers and Urban Sketchers Seattle! The only art I ever work on is filling my sketchbooks with daily sketches! A writer by trade and an urban sketcher the past three years, my “work” (as it relates to art) consists of thinking about what my next sketch will be – and then sketching it. A secondary part of the “work” is blogging – telling the stories related to the sketches – which I enjoy almost as much as making the sketches. In my mind, the two parts go hand-in-hand: Sketch the story, and then supplement it with words. The result is a thorough documentation of my own creative process over the past three years since I began to draw. 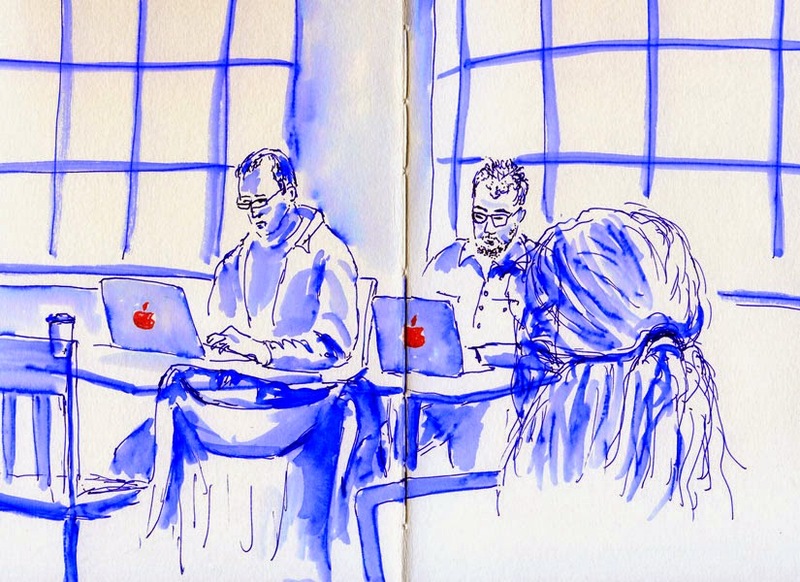 My work is typical of the urban sketching genre in that I follow the Urban Sketchers manifesto of drawing on location and showing my world through sketches, whether at home or while traveling. 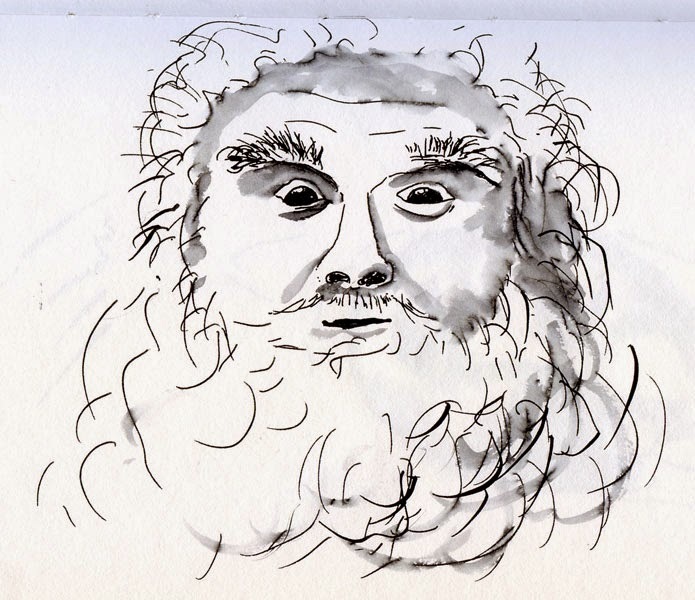 Perhaps one way in which my blog differs is that it is entirely process-driven rather than results-driven: I post any sketch that tells a story – not just the sketches that I think are “good enough” for public consumption. My blog is not a showcase of my best work; it’s the documentation of my growth and creative process. It’s all about learning. 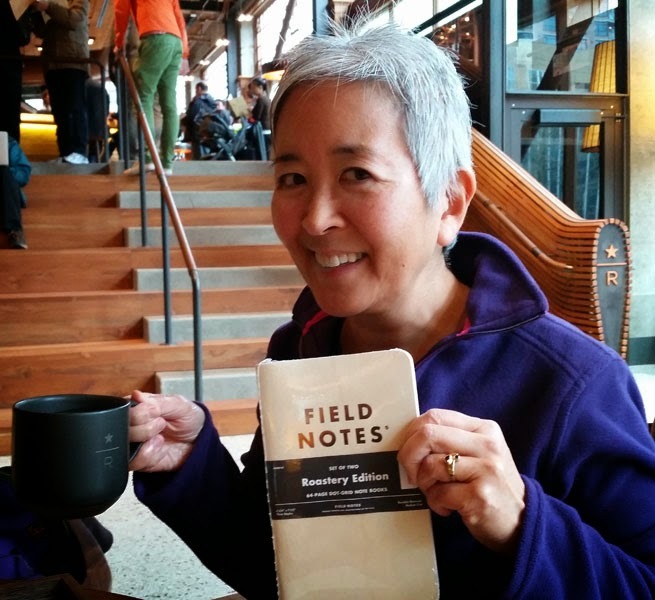 I have been a lifelong journal writer – a practice that makes me more observant but also more introspective. Sketching, too, makes me more observant, but rather than making me look inward, it takes me out into the world. 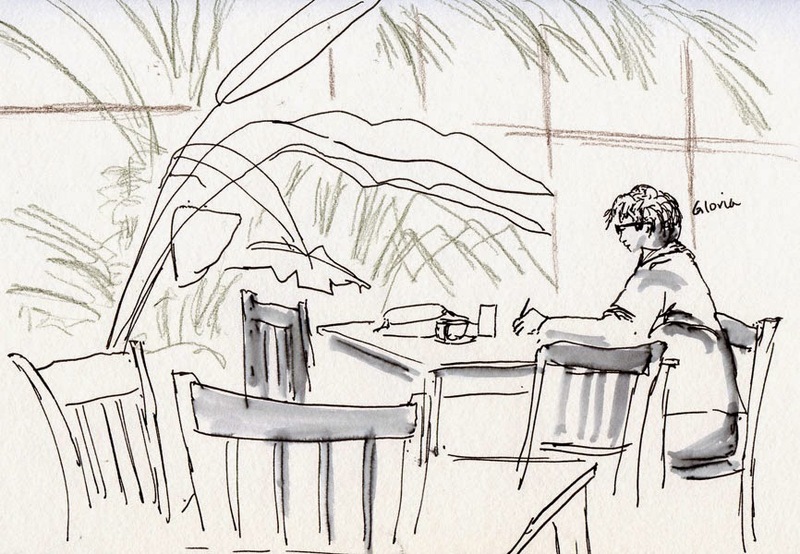 Whether I’m sketching a beach in Rio Janeiro or a neighborhood coffee shop, I learn something about my surroundings that I could not have learned in any other way. My creative process is often motivated by the art materials I use or want to try. If I have a new fountain pen in my bag or a new brush marker, I can’t wait to try it on my next sketch! But that’s just the initial impetus. Ultimately, my creative process is driven by the subject matter: Something catches my eye for whatever reason, and I feel compelled to express it through drawing. Every sketch I make teaches me something that prepares me for the next sketch. Again, it’s all about learning. March 16, King Street Station: The day after taking Stephanie Bower’s “Good Bones” workshop, I sketched this interior scene of King Street Station and congratulated myself for finally “getting” perspective! March 29, young sketcher at MOHAI: During one of my three stints as a sketcher-in-residence at the Museum of History and Industry, I made this quick sketch of an enthusiastic girl drawing at the gallery window. 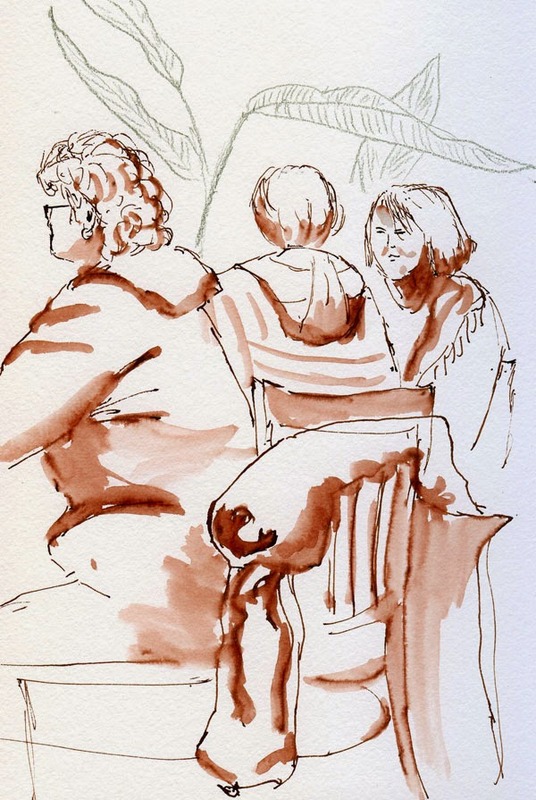 It was so much fun interacting with participants who came to see Gabi’s “Drawn to Seattle” exhibit, and it made me proud to be an Urban Sketcher! 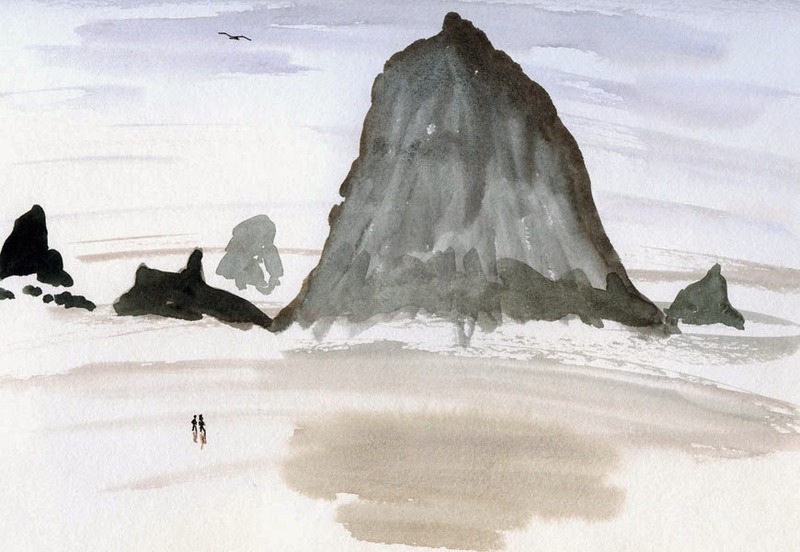 May 19, sea stars at Cannon Beach: I made lots and lots of sketches of Haystack Rock and the seashore at Cannon Beach, Oregon, but my most memorable were the ones I made while beachcombing during low tide – because of all the swarms of annoying sand flies I had to battle while sketching! June 30, Green Lake: On a beautiful summer afternoon, I skipped my yoga class to sketch at the lake instead! For me, it was a celebration of the good sketching weather ahead. an important icon in my childhood, and this was the first time I had had the opportunity to sketch them. This dramatic viewpoint made the sketch especially memorable. July 25, Lake Union from the top of a house boat: Sketching from a Lake Union house boat was definitely one of my most memorable Friday sketch outings. The weather, the water, the rare, unique opportunity – that’s hard to beat! 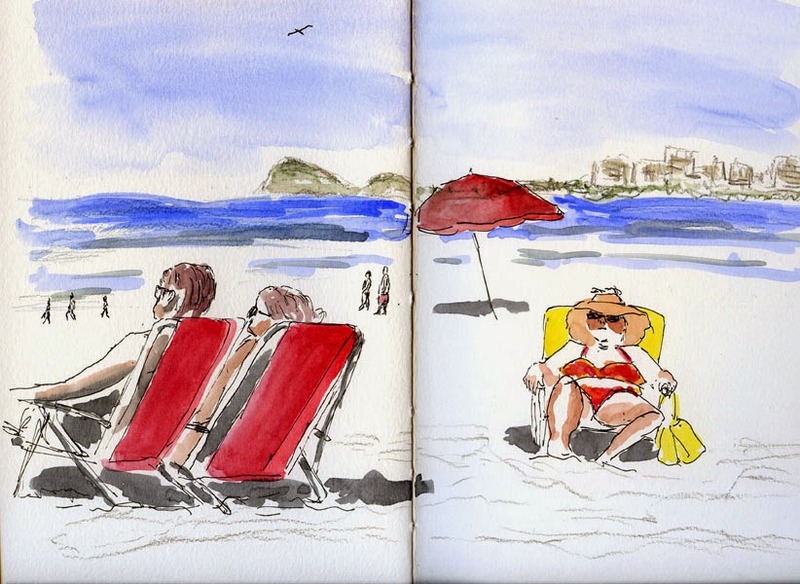 Aug. 24, Copacabana Beach, Rio de Janeiro: On our first full day in Brazil when we were still recovering from nearly 24 hours of flying to get there, we decided to do nothing more ambitious than lounge on the beach. Under an umbrella, sipping a beverage, a soft breeze occasionally blowing in from the surf – heaven! 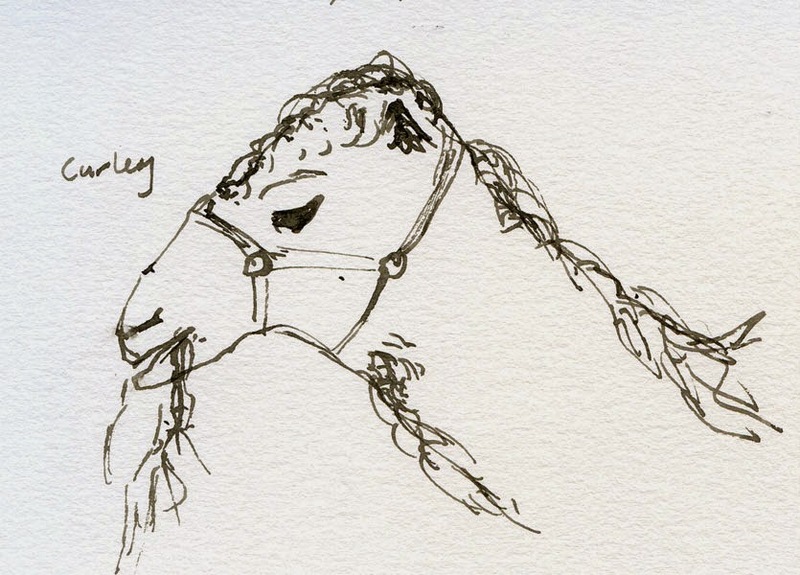 Aug. 29, horse carriage, Paraty: After seeing Ch’ng Kiah Kiean’s magical use of an ordinary twig to sketch amazing scenes, I was stunned. I picked up a twig from the ground, borrowed KK’s ink, and had my eyes opened to a new way of sketching that I am still exploring with fascination. resist one more sketch from our trip to Brazil (definitely among my most memorable travels). This one was made on the last afternoon of the Urban Sketchers Symposium when all symposium participants as well non-attending sketchers gathered in Matriz Square for a final sketchcrawl. Standing on a bench to sketch this, seeing hundreds of sketchers sketching and socializing as the light began to fade, I was thrilled to be among them. Sept. 27, Pike Place Market: I had been somewhat intimidated by this much-photographed, iconic scene – people from around the world who have never visited Seattle have probably seen it – but I sketched it anyway. I was happy I did; the experience gave me a fresh look at the familiar. fashioned to look like an elastic-banded sketchbook. 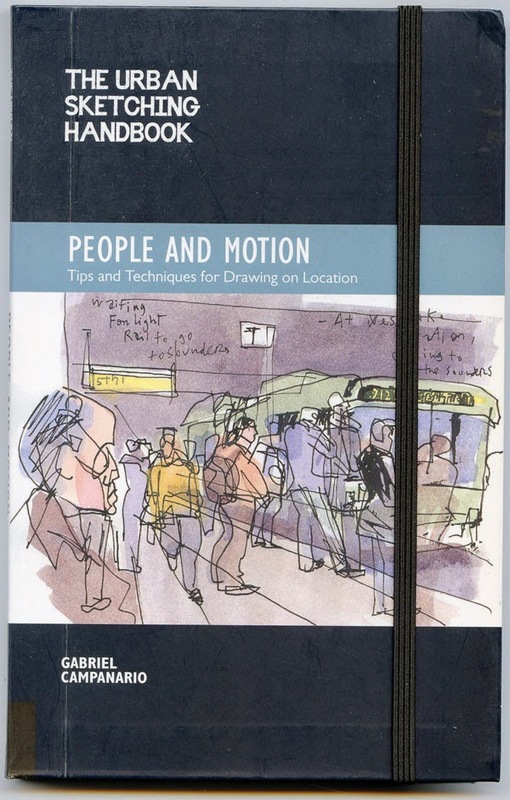 The second book in Gabi Campanario’s Urban Sketching Handbook series has just been released on Amazon.com: People and Motion: Tips and Techniques for Drawing on Location. Identical in format to the first in this series, Architecture and Cityscapes, the latest book is a succinct, compact volume that focuses this time on people in the urban landscape – how to capture their poses and moves accurately and expressively. It’s jam-packed with practical information and inspiring examples for both the beginner and the more seasoned urban sketcher. The meat of the book examines six keys as they relate to drawing people: proportion, contour, gesture, expression, context and likeness. 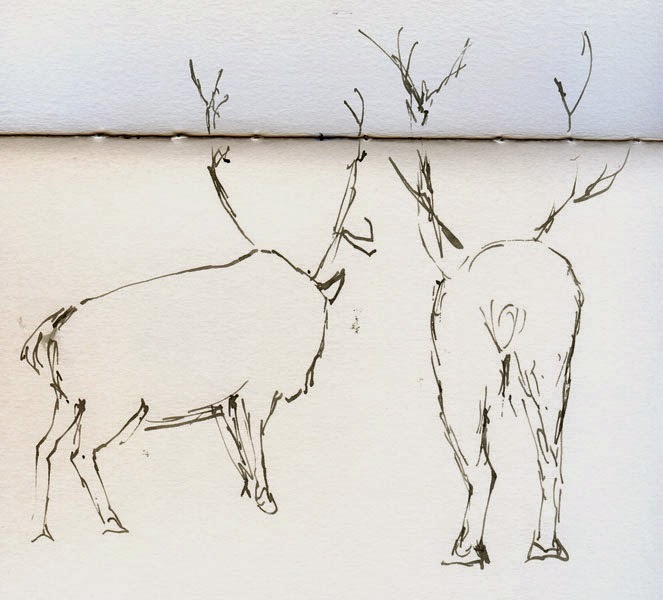 While including tips such as classic studio drawing lessons (an adult’s total height is about seven-and-a-half to eight times the head height), Gabi stresses ideas that can be practiced in the real world, such as while using public transportation or in a cafe. 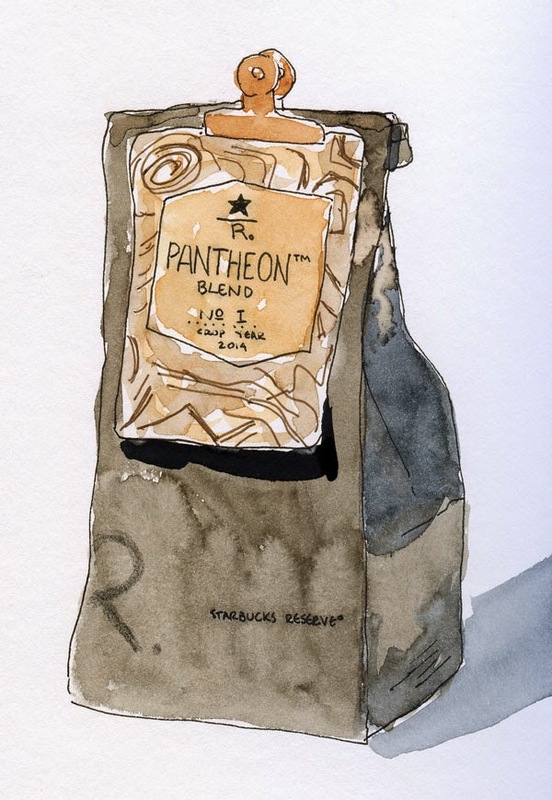 The final section of the book is a gallery of sketches by artists in the worldwide urban sketching community, including many of my favorites. 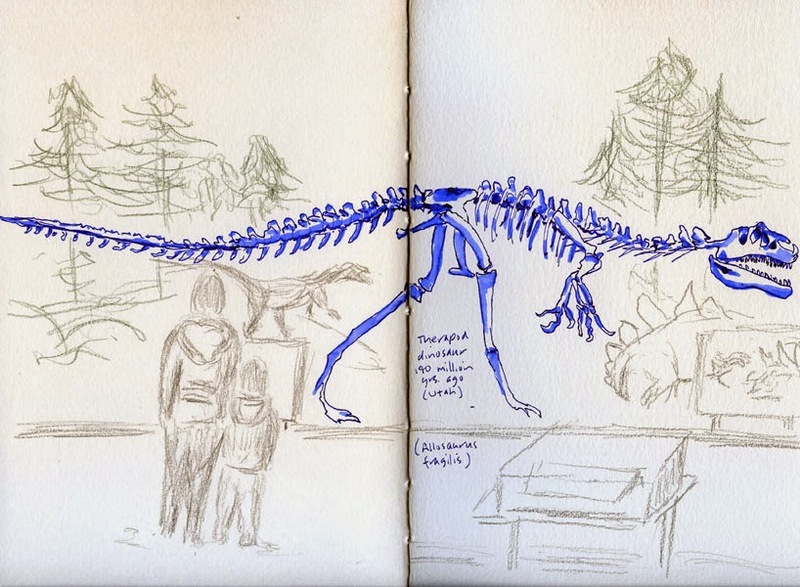 An illuminating aspect of all the sketches featured in the book (as well as in the series’ first book) is that the artists have included the approximate length of time they took to make each sketch. Although I am a relatively fast sketcher myself, I am amazed and inspired by how much story can be told in a mere 10- or 20-minute sketch. If you have an hour or two to spare, it’s wonderful to be able to use that time to flesh out an entire urban scene. But what if you have only the length of a coffee break? 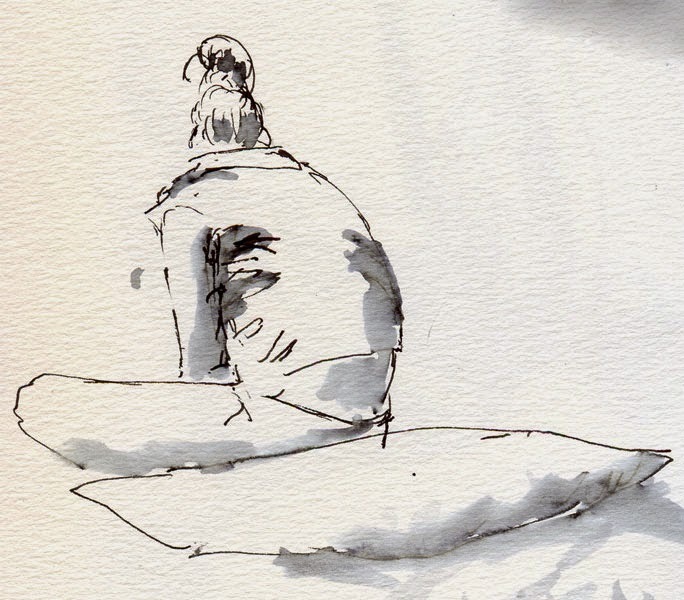 You can still tell a story with a sketch – one that only you can tell. That’s what urban sketching is all about. 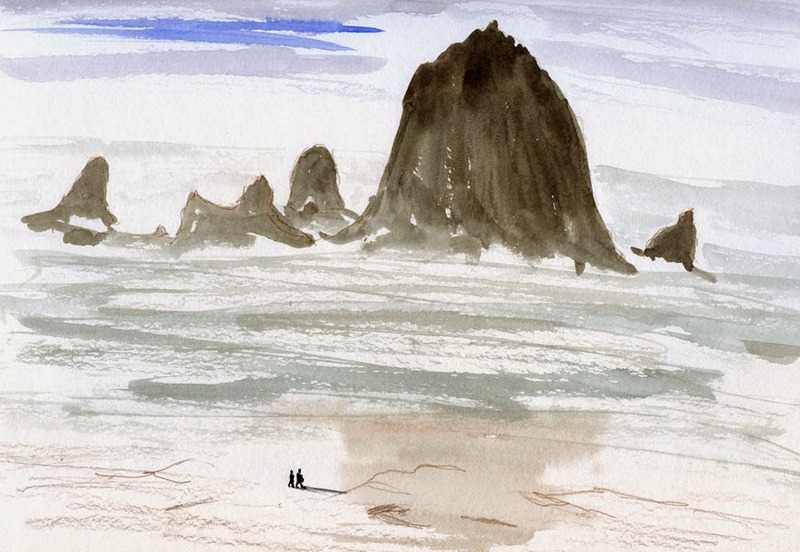 Our Christmas gift to each other this year was to spend most of Christmas week at one of the most beautiful places on earth (which is, luckily for us, only four hours away): Cannon Beach, Oregon. We usually go in the spring or fall, but our favorite beachfront hotel was offering a half-price deal during the month of December, so it was impossible to resist. Both festive and serene, the town was dressed up in lights for the holidays, and yet we had the place nearly to ourselves. It was the best of all holiday worlds! The beach itself, on the other hand, was somewhat dark and somber – not from the weather (which was mostly moderate and only a little rainy) but from weather-related events. 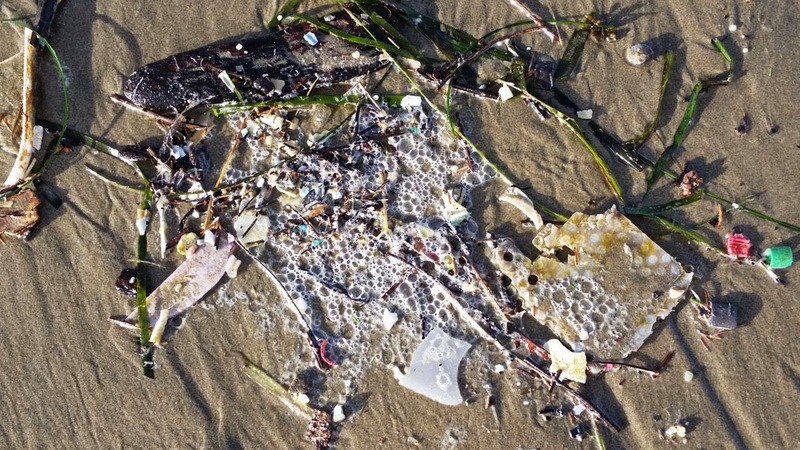 Last week’s storms pushed in a lot of debris from the ocean, including piles of plastics and other garbage from the 2011 Japan tsunami that is finally reaching Pacific Northwest shores. That devastating event had caused a swirling garbage pit to float around on the Pacific for all these years, and some of it is finally here. 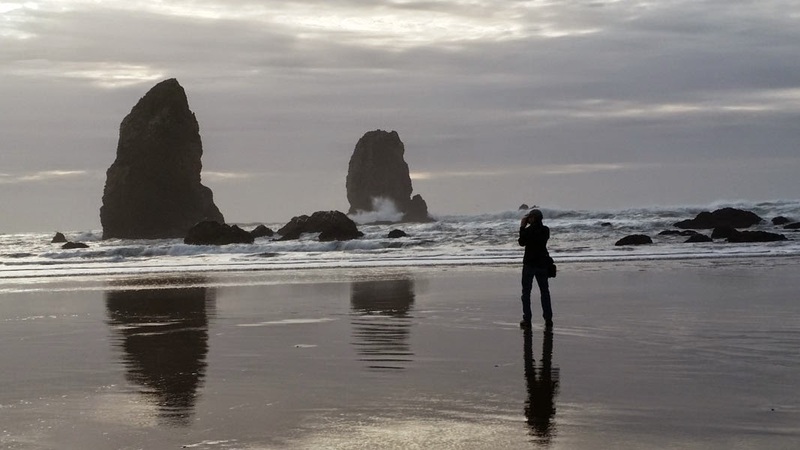 A crew of city staff and volunteers was busy at work during low tide picking up as much debris as possible from Cannon Beach’s normally pristine sand. At the same time, hundreds of dead birds were all over the shoreline everywhere we looked. We asked around to try to find out what caused the kill, but we weren’t able to determine whether it was a natural phenomenon or related to the garbage. 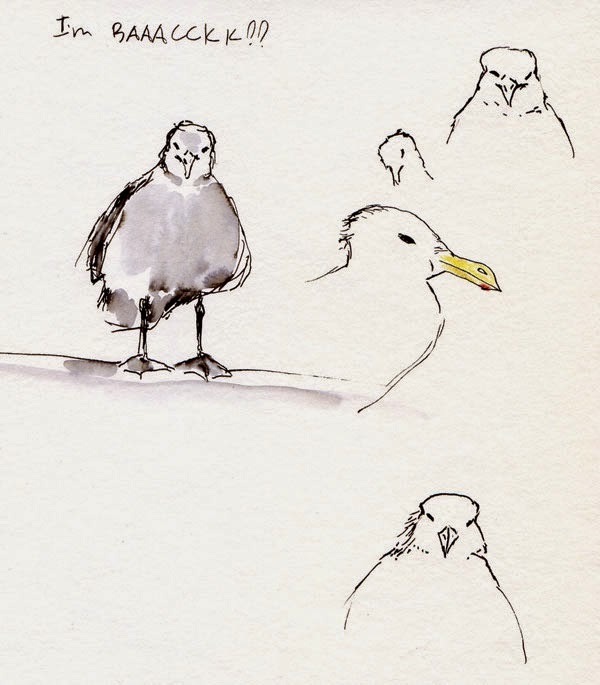 Fortunately, not all the sea birds were dead: Every morning when I opened the curtains, a seagull would immediately appear on our deck railing, hoping for handouts. Persistent as well as patient, he always stuck around long enough for me to fill a page or two in my sketchbook. 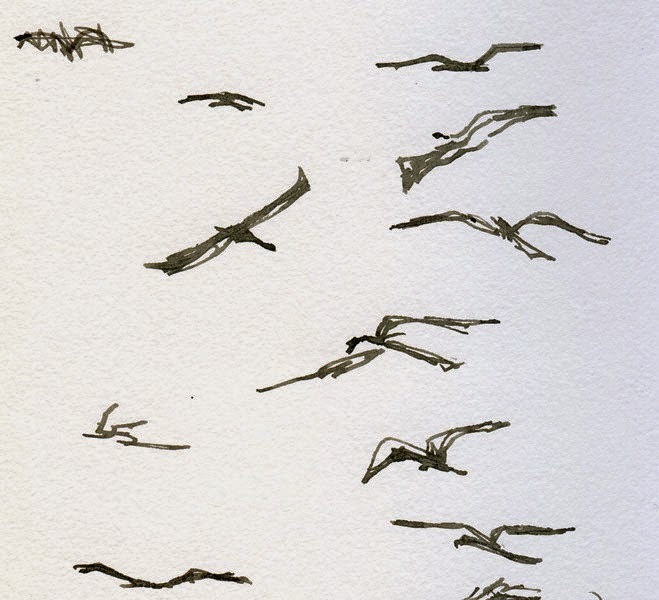 Other times I’d simply watch a flock of gulls soaring over the water and try to capture the gesture of flight without resorting to the stereotypical twin curved lines I used to draw when I was a kid. 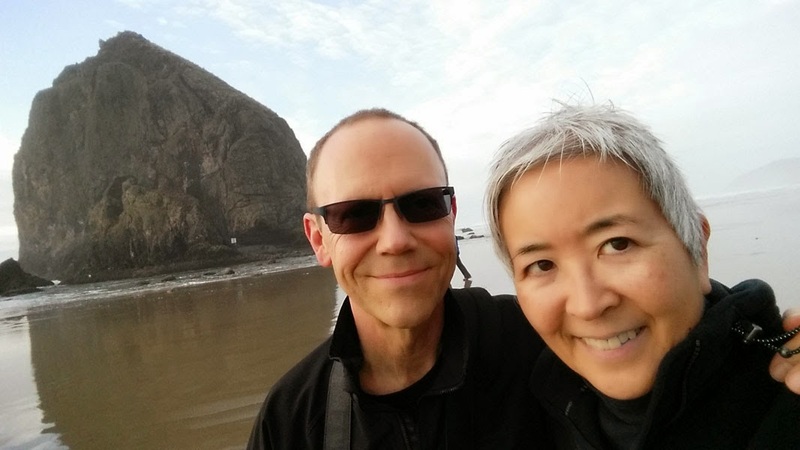 Despite evidence of various traumatic events, we enjoyed many long walks along the shores of Cannon Beach – still one of the most beautiful places on earth. 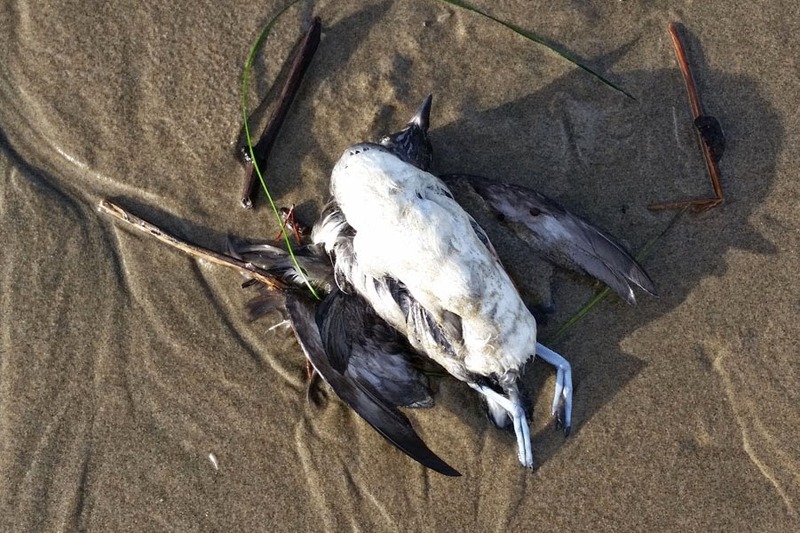 One of hundreds of dead birds on the beach. 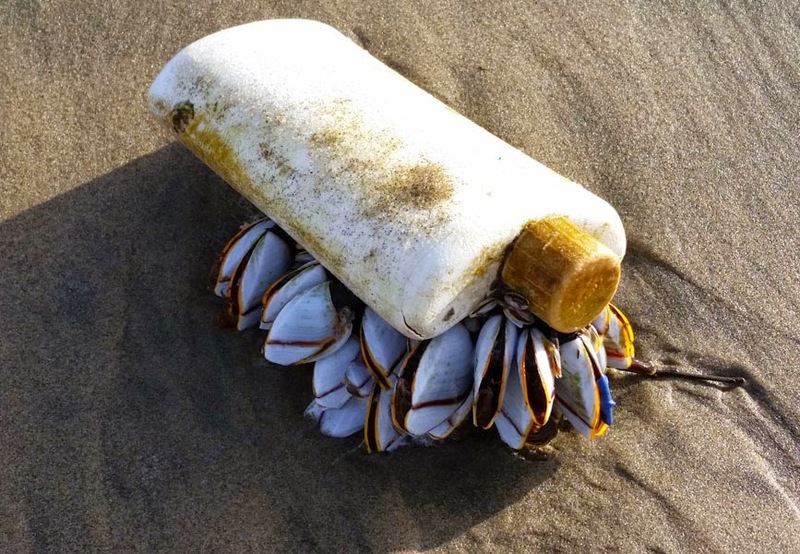 Barnacles growing on a plastic bottle. Lots of debris washing up. A couple of weeks ago when I reviewed several shows at the Bellevue Arts Museum, I mentioned that many art exhibits are not sketchable for various reasons. The current exhibit at the Seattle Asian Art Museum, “LiveOn: Mr.’s Japanese Neo-Pop,” would fall into that category. Not only was it not sketchable; I don’t really know how to talk about it. The most startling work is a room full (and I mean literally full; there’s barely room to walk around) of what I will charitably call “stuff” – a lot of everyday life detritus. Piles and piles of old books, outdated appliances and electronics, cartons, broken furniture – a small mountain of stuff. Ultimately you come to realize that it’s a statement about the 2011 tsunami that devastated Japan. In another piece, a wall is covered with a montage of heartbreaking photographic images of the devastation. In another section of the exhibit are Mr.’s huge, colorful paintings inspired by manga and anime. I did find one thing to sketch. A 30-minute film called “Nobody Dies” produced by Mr. was being shown in a room that also displayed costumes and props that were used in the film. 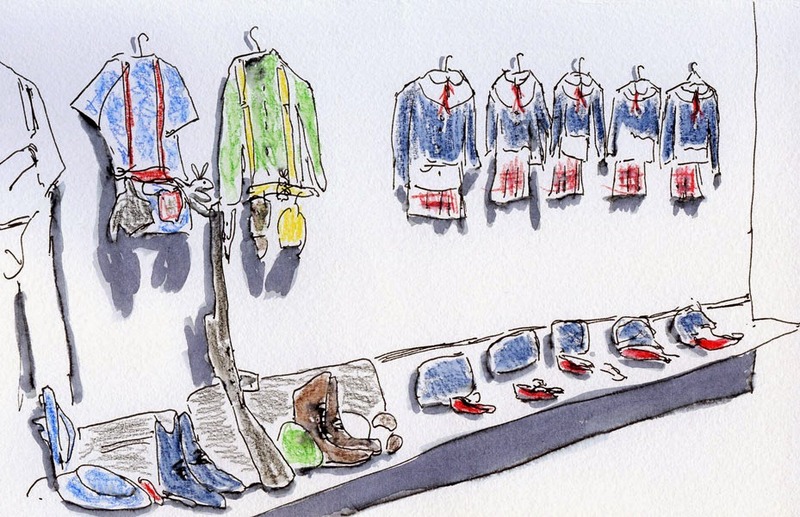 While Greg viewed it, I stood in back and sketched the costumes and props. As was true last year, many items remain the same (marked with *); if something is working well for me, I tend not to go looking for something to replace it simply for a change. (Four products have remained on the list all three years: Nos. 2, 3, 4 and 6. Hmmm. . . I’m so consistent, perhaps I should change this to a top 5 list and include only new items?). On the other hand, I’m always exploring new products, so a few things dropped off the list to make room for others. My criteria for products appearing on the top 10 change from year to year. For 2014, they are reliability (therefore generally making them most-often used), unique properties (enabling me to do things that no other product can), convenience (allowing me to sketch faster or more easily and therefore more often) or “just because” (I always like to allow for the whim factor). As in previous years, except for No. 1, the numbering does not necessarily indicate a ranking. 9. Twig and India ink. Hands down, experimenting with a common twig as a drawing instrument was my single biggest takeaway from the Urban Sketchers Symposium in August. Thanks to Kiah Kiean, I am still exploring this tool, which has unique properties like no other. 8. Caran d’Ache Museum Aquarelle water-soluble colored pencils. I’ve always kept a few water-soluble colored pencils in my bag, but it wasn’t until this year that I started using them more regularly, and one reason was my discovery of the Caran d’Ache Museum line. Since I almost never use a graphite pencil for anything, I find myself using these colored pencils as a substitute. Although all artist-quality water-soluble colored pencils wash to rich hues with water, Museum pencils are so soft and beautiful even when dry that I find myself reaching for them whenever I want to indicate texture, especially in the background of a sketch. They just feel good to use. Their watercolor qualities are a bonus. 7. Pilot Petit1 fountain pen. This little pen doesn’t get used very often. I keep it in the tiny bag I take on fitness walks, when I usually don’t sketch but occasionally spot wildlife that I can’t bear to pass up. But it’s for that very reason – that I hardly use it – that it made it onto my top 10. This small, very inexpensive pen has the longest idle time of any pen I’ve used. Ink it up, forget about it – and six months later, it will still write like you’ve been using it all along. Remarkable! 6. * Kuretake waterbrushes filled with ink. Last year the Kuretake waterbrush filled with Diamine Grey ink appeared on the top 10 for making shadows easy to apply. I still use that gray ink as well as other grays for shadows (Pilot Iroshizuku Fuyu-syogun is a current favorite), but now I also carry green inks for quick foliage and Pilot Iroshizuku Tsuyu-kusa for blue skies. (See, this is the more objective, less whimsical [see No. 10] reason that Iroshizuku inks made it onto my list.) They’re not as versatile or esthetically pleasing as watercolors, but you can’t beat the speed and convenience. 4. * Platinum Carbon Black ink. This waterproof ink has made it onto my top 10 all three years, and for good reason: It has never let me down. It dries almost instantly, is completely waterproof and has never clogged any pen. I’m currently flirting with DeAtramentis Document and Super 5 inks, but I haven’t used these newer waterproof inks long enough to say whether they could supplant trusty Platinum. In fact, Platinum Carbon Black is the standard by which I judge all others. 3. * Kuretake Zig Clean Color Real Brush markers. Ever since I discovered the versatility of putting inks of my choice into waterbrushes (No. 6) – essentially making my own brush markers – I’ve been using Zig markers less frequently. Still, if you like to sketch heavy equipment like I do, what I call “construction zone yellow” gets used more often than you’d think. When I need just a touch of that truly unnatural color for a traffic cone or a construction crane, a Zig comes in very handy. I also like to keep a few in my bag based on seasonal needs. For example, I always keep bright red and green in my bag in December (handy for quick Santa sketches). 2. * Diamine Chocolate Brown ink. I would be embarrassed to tell you exactly how many bottles of ink I own. Yet somehow this particular shade of warm brown is still the one I reach for most often, at least for sketching. 1. 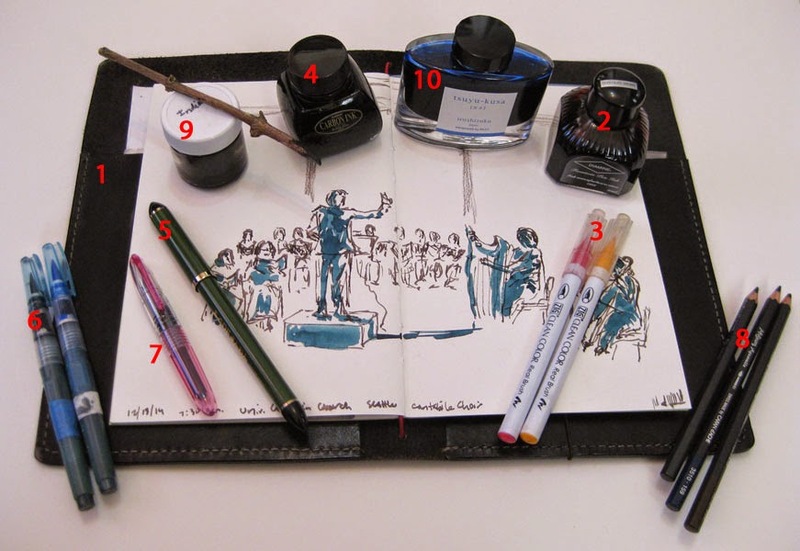 * My “Stefano” sketchbook system. Regular readers of this blog will find no surprises here. For its versatility, flexibility, durability (it’s been on three continents with me so far!) and for ultimately leading me to discover the joys of bookbinding, the Stefano is still No. 1. And that brings me to . . . Some of my handbound sketchbooks. 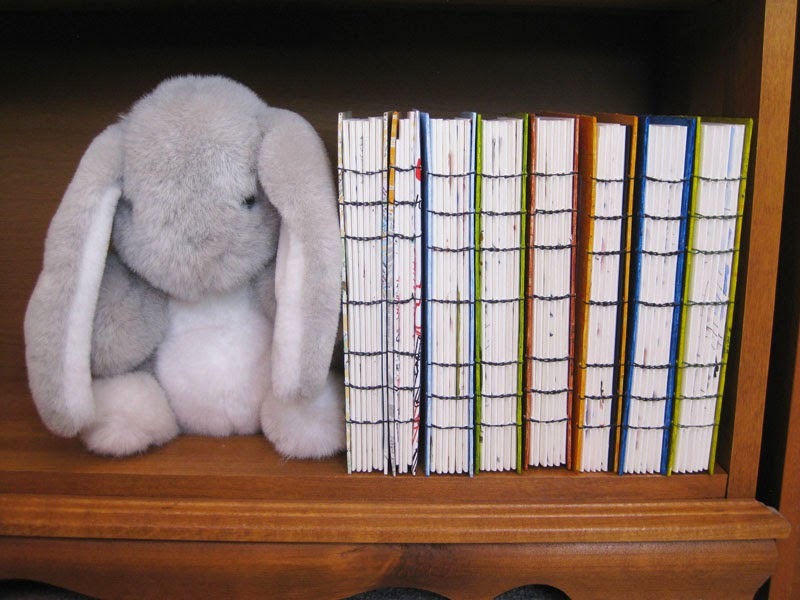 Honorable mention: My growing collection of handbound sketchbooks – I have 16 now – isn’t exactly a sketching supply or tool; the books are the result of sketching. But seeing them lined up on my bookshelves makes me very happy – both for the sketches they contain and the entire sketching process they represent. They deserve special mention. 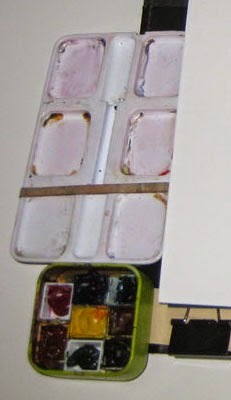 Also worth mentioning here is one significant item that fell off the list: my DIY mint tin watercolor sketch kit/mixing palette assembly. Watercolors are certainly still a basic part of my daily-carry sketch kit (as are several other items that fell off the list this year). But as far as the attachment assembly goes, which is the part that made my kit unique, I use it less frequently lately. When I have to sketch standing up, I’m more likely to reach for waterbrushes filled with ink (see No. 7 above), which are far more convenient. After last week’s evasive action by Santa, I planned my time more carefully today and arrived at Northgate Mall well before his lunch break. Unfortunately, it was apparently too early for much Santa business, because he didn’t have any customers. 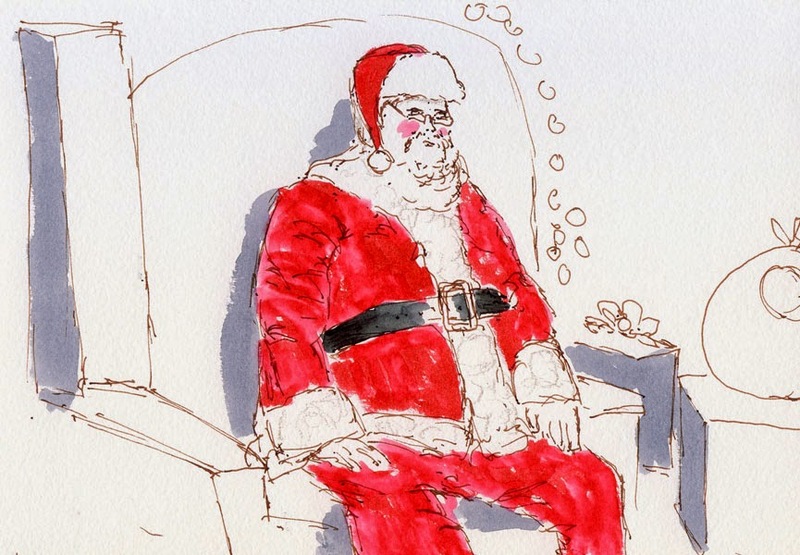 But my goal this holiday season was to sketch three or more Santas, not his customers, so I win! Whew. This Santa stuff is exhausting. In front of the main bar. 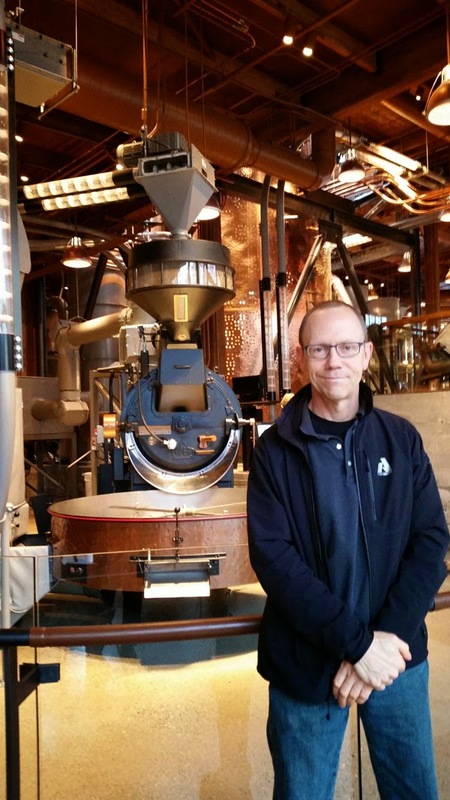 The huge space is filled with copper piping and transparent pneumatic transfer tubes filled with coffee beans being transported along “the journey of the bean,” as the brochure says. When you’re washing your hands in the unisex restroom area, you can look out over the inner workings of the small roasting equipment. It’s right out of Willy Wonka! 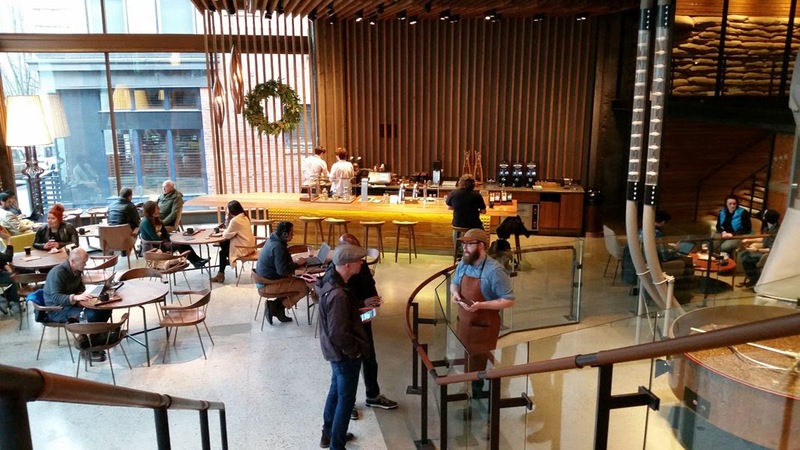 As for sipping your cup o’ Starbucks Reserve (I chose Pantheon blend brewed on the Clover), you can sit at small tables, large tables, low tasting tables, a rentable “library” space, a fireplace or several bars. Tina sucked in by two marketing machines! Hook, line and sinker. I was dazzled. And as long as I was sucked in by all the hype, I decided to go all the way. Although I sometimes use Field Notes Brand notebooks for memos, I’m not crazy about the paper for sketching or even writing because it’s not great with a fountain pen. 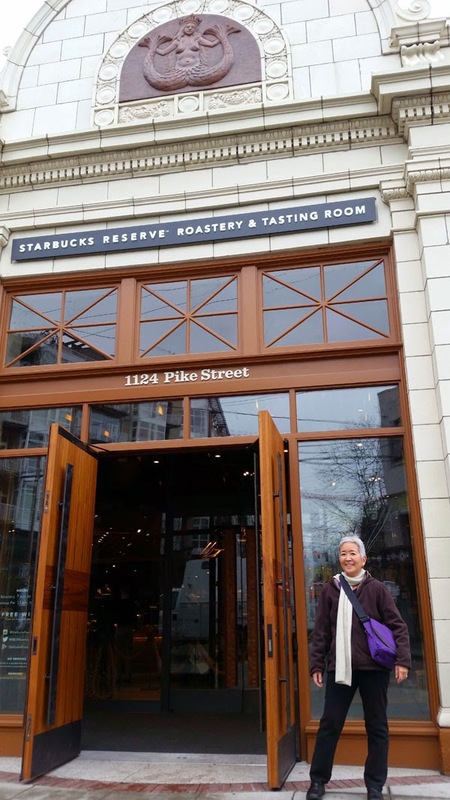 But I had heard that Field Notes had come out with a limited-edition run of Starbucks Roastery-branded notebooks that would be available only at this one store. Guess who bought a few? Ah, retail marketing – you gotta love it! Lower level seating and bar.